Saint Dr. Gurmeet Ram Rahim Singh Ji Insan ,announced his next flick, Jattu Engineer on March 7th, 2017 during an inauguration event. 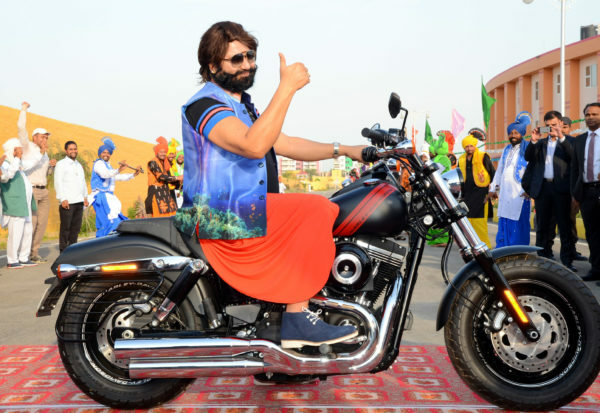 A comedy Film starring Saint Dr. Gurmeet Ram Rahim Singh Ji Insan, himself and Directed by FDD (Father-Daughter Duo) Saint Dr. Gurmeet Ram Rahim Singh Ji Insan & His daughter HoneyPreet Insan. The announcement of this next Film Jattu Engineer has brought a new wave of wait and excitement in the Fans. Jattu Engingeer is a comedy film based on a backward village. There is a school in the village, but no teacher. Localities of the village are lazy and drug-addicts. The Lead cast of the movie Saint Dr. Gurmeet Ram Rahim Singh Ji Insan will play the role of a Rajput Teacher. The film will portray how this teacher transforms lives of villagers. The film will be having ingredients of many social messages along with 2-3 songs. The film is expected to complete in 20-30 days. Overall cinematography will be done in Sirsa, except some scenes. Saint Dr. Gurmeet Ram Rahim Singh Ji Insan’s each production brings messages to its viewers. In Jattu Engineer as well, he will carry on the cleanliness campaigns & contribute towards Swachh Bharat Abhiyan, initiated by the Prime Minister of India, Mr. Narendra Modi. There will be many more messages for the viewers along with a healthy dose of comedy. Saint Dr. Gurmeet Ram Rahim Singh Ji Insan said that Jattu Engineer is based on true story with the pinch of healthy humor. The movie will be full of comedy without conventional elements of dual meanings.Various languages viz. Punjabi, Hindi, Marwadi and vocalization or dialects of Uttar Pardesh will be used in the film. Meanwhile Hind Ka Napak Ko Jawab is running successfully with packed houses all over in its 3rd week. HKNKJ has sparked patriotism across all genres and age groups and continues to inspire millions. HIND KA NAPAK KO JAWAB IS THE ULTIMATE JAWAB TO ALL THE QUESTIONS LITERALLY!